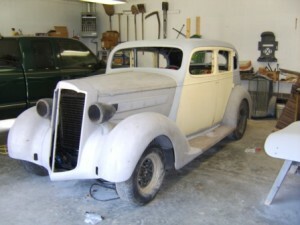 Harold Gilreath is working on his 1937 115C four door touring sedan. He has installed a Chev 350 engine, 350 turbo transmission, GM 10 bolt rear with 2.73 gear, a custom made, balanced driveshaft, and a 1974 Nova sub-frame with Fat Man shortened upper and lower A-arms. 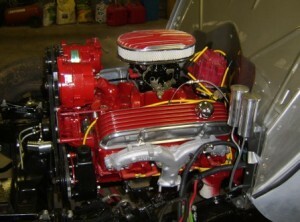 The engine is ready to fire. Just need paint, glass, upholstery and final assembly.